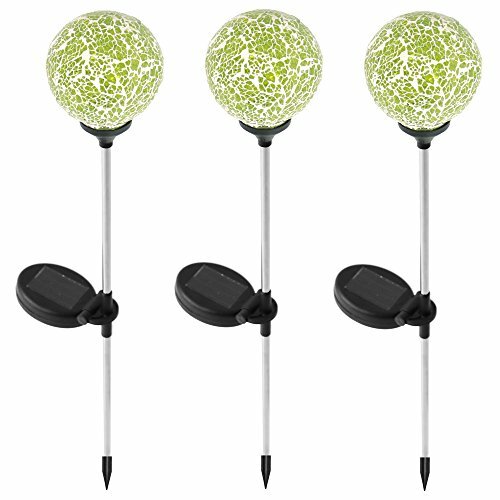 OVERALL DIMENSIONS: Yard lights are 32.5 inches long x 3.5 inch sphere top, making them perfect to use as pathway or walkway lights. DURABLE DESIGN: Solar light is made of shimmering glass and sturdy stainless steel. They are designed for outdoor use and are sure to hold up to the elements. MULTI-USE AND FUNCTIONAL: LED lights make a great addition to any patio, deck, garden, or landscape. May also be used in the driveway or sidewalk as pathway lights. 1 YEAR WARRANTY: Sunnydaze Decor backs its products with a 1-year manufacturer's warranty for worry-free purchasing. View More In Figurine Lights. If you have any questions about this product by Sunnydaze Decor, contact us by completing and submitting the form below. If you are looking for a specif part number, please include it with your message.